April 21, 2017, 10:56 a.m. 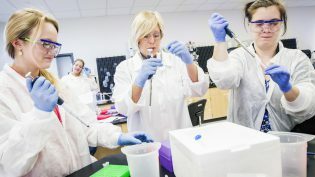 The health and life sciences site is in talks with other newspapers about republishing its coverage in print. 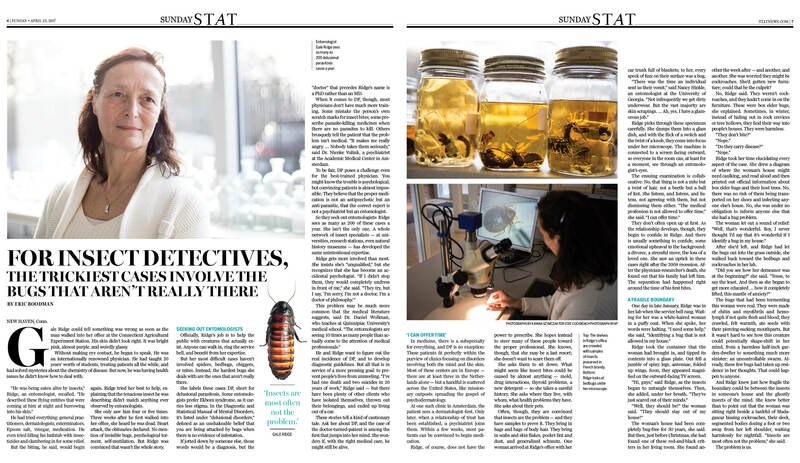 By Joseph Lichterman @ylichterman April 21, 2017, 10:56 a.m.
Last month, Stat, the health and life science news site, published a story about insect detectives: entomologists who encounter people who falsely believe that their homes or bodies are infested by bugs. The story received a fair amount of attention when it was originally published online, but this Sunday a whole new audience will be exposed to the story by Stat reporter Eric Boodman. Boodman’s piece is the cover story for Sunday Stat, a new print product Stat is launching in partnership with The Boston Globe. The Globe and Stat are both owned by John W. Henry, and Sunday Stat will appear as a glossy 12-page tabloid that will be distributed with the paper this Sunday. Though Sunday Stat is initially being published in the Globe, the site would like to bring it to other newspapers as well. Editor Rick Berke told me Stat is in discussions with other metro papers about possibly selling a print version of Stat coverage for them to reprint and distribute. Boston Globe managing director Linda Pizzuti Henry (who is the wife of owner John Henry) told me Sunday Stat will be a “wonderful benefit for our subscribers.” Because the Globe owns its printers, the Stat supplement was “a very low-risk proposition” to try and grow Stat’s readership, Linda Henry said. The Globe has a Sunday print circulation of about 234,000, according to the Alliance for Audited Media. “It is still a digital-first publication, and it’s going to remain that way…For Stat, this is a wonderful complement and it’s going to introduce a whole new audience to Stat,” Henry said. There are two full pages of ads in Sunday Stat, and Berke said there is already advertiser interest for a summer version of the supplement. The Globe’s sales team sold ads for Sunday Stat, and Stat worked with a designer from the Globe to put the tabloid together. Sunday Stat is made up of mostly feature stories that aren’t time-bound and that were originally published on Stat’s website that are being repurposed for print. Boodman’s bug story, for instance was 3,000 words long when it was published online, but it had to be cut in half to fit in the print tabloid. The Globe regularly reprints Stat stories online and in print, and there’s a Stat widget on the Globe’s homepage. Berke estimated that the Globe publishes half a dozen or so Stat stories in the paper a week — mostly in the business section. But the stories that are appearing in Sunday Stat haven’t appeared in the Globe before. Stat launched in 2015 as a free, ad-supported site. Last year, it introduced Stat Plus, a subscription product. Stat has also put on events, tried sponsored content, and looked for other ways to build a sustainable business model. POSTED April 21, 2017, 10:56 a.m.
Lichterman, Joseph. 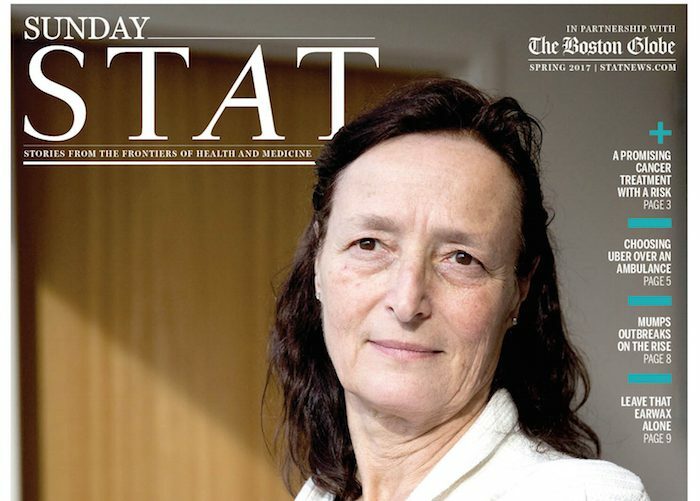 "Stat is publishing a print section in Sunday’s Boston Globe — and it might be coming to a paper near you." Nieman Journalism Lab. 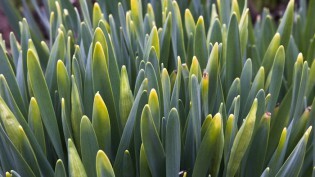 Nieman Foundation for Journalism at Harvard, 21 Apr. 2017. Web. 18 Apr. 2019. Lichterman, Joseph. 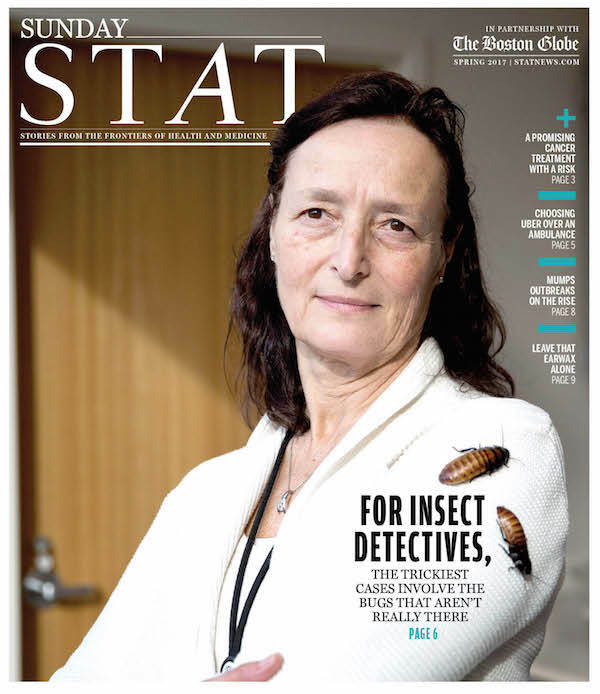 "Stat is publishing a print section in Sunday’s Boston Globe — and it might be coming to a paper near you." Nieman Journalism Lab. Last modified April 21, 2017. Accessed April 18, 2019. https://www.niemanlab.org/2017/04/stat-is-publishing-a-print-section-in-sundays-boston-globe-and-it-might-be-coming-to-a-paper-near-you/.